From diving with great whites to soaring high over the outback landscape, Australia has adventure-charged activities to please even the most seasoned thrill seeker. Rappel the Gordon Dam in Tasmania’s south-west wilderness. Ranked as one of the top 10 adrenaline activities in the world, rappelling the Gordon Dam at Strathgordon in Tasmania’s south-west wilderness, around two-and-a-half hours’ drive from Hobart, is as impressive as it sounds: at 459 feet the dam is higher than the Sydney Harbour Bridge and represents the world’s tallest commercial rappel. Hurtling at high speed across the water, the wind whipping at your face, is sure to get the adrenaline pumping. Jet boat rides on Sydney’s famous harbor include sideways slides, fish tails, wave riding, whiplash-inducing power brake stops and 270-degree spins. For more on Sydney, read our ultimate guide. Going anywhere near great white sharks or giant saltwater crocodiles is not something that most people would even entertain the thought of, but serious adrenaline junkies can do just that. 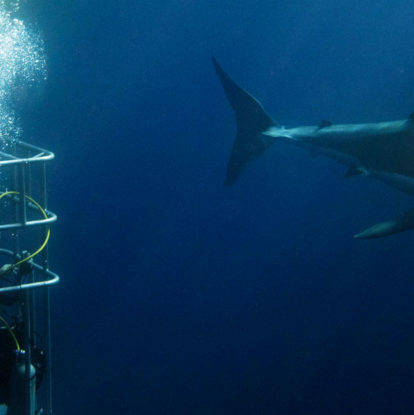 Adventure Bay Charters will take you 43 miles off Port Lincoln in South Australia (it’s a 50-minute flight from Adelaide), lower you below the surface in a metal shark cage and attract the apex predators in a eco- and shark-friendly manner, with music. At Darwin’s Crocosaurus Cove, spend 15 minutes inside a transparent box that is lowered into a crocodile enclosure. Swim with great white sharks in Port Lincoln, South Australia. At over 885 feet above the streets below, SkyPoint Climb is Australia’s highest external building climb atop the landmark Q1 Resort Building, which dominates the Gold Coast skyline. And for the absolute best view of the Sydney Opera House, book a place with Bridgeclimb Sydney and head to the top of the Harbour Bridge’s famous arches. If you don’t have time to do a diving course or you are not a confident swimmer, you can still get below the surface of the Great Barrier Reef. Sea walking along the sand of the sea floor on the 6000-year-old coral cay of Green Island, 16 miles off the coast of Cairns in Queensland, you will be surrounded by the plentiful fish and coral of the Great Barrier Reef Marine Park. Snorkel or swim with dolphins. There are various places to swim with wild dolphins around Australia: try heading to the Bunbury Geographe region of Western Australia, two hours south of Perth, to the Dolphin Discovery Centre where the bottlenose dolphins choose to approach swimmers (instead of the other way around); at Dolphin Swim Australia in Port Stephens, 2.5 hours’ drive north of Sydney, swimmers are clipped to the tow rope of a catamaran to swim in time with dolphins; Moonraker Dolphin Swims’ snorkeling experiences depart from Sorrento on Victoria’s Mornington Peninsula, just over an hour’s drive from Melbourne. Ride along the beach on horseback in Margaret River. See the beautiful white-sand beaches, thick bush and plentiful vines of Western Australia’s Margaret River region from horseback with Globe Trotting’s five-day (four-night) ride. Head out each day on one of Jesters Flat’s gorgeous Australian stock horses to sample the best Margaret River wines, meet creative locals and, the best bit by far, go bare-back swimming with the horses in the crystal-clear waters of the Indian Ocean. Floating on the cool morning air over the West MacDonnell Ranges from Alice Springs with Outback Ballooning is an ultimate outback experience. Rise before dawn to be rewarded with views of the Red Centre landscape and wildlife below as the sun rises from the horizon to warm another day in the desert.